The Nexus S 4G is, without a doubt, a great phone - but as of now, many units ship with a major flaw: they often have trouble connecting to 4G or even WiFi. 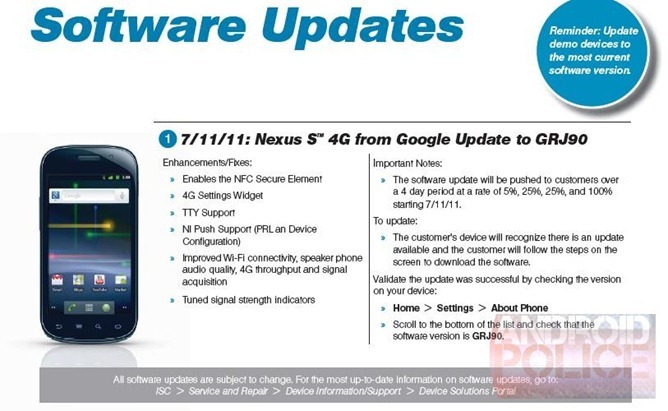 The issue doesn't affect all Nexus S 4Gs, as shown by Android Central's poll on the subject, but those suffering from it are understandably unhappy with their devices. And though it may have seemed that Sprint was turning a blind eye to these users' woes, it turns out they've actually been working on an update that will address this issue. Bearing the build GRJ90, the update will start its four-day rollout on the 11th. In addition to fixing the aforementioned signal issues, it will add a widget for 4G settings, support for TTY (teletypewriter) and NI push, and "tuned" signal strength indicators. GRJ90 will also enable the NFC secure element, which will be essential to the upcoming Google Wallet payment app. Certainly not a game-changing update - that's Ice Cream Sandwich's job - but we're sure that if nothing else, it'll turn this guy's frown upside-down. Exclusively confirmed with Captain Anonymous; separately posted by SprintFeed.